As a future educator, I have been repeatedly told that the best way to teach secondary students is through issues that matter to them, and I have repeatedly seen that method fail – until today. It’s May 6, 2017 and I’m at the Environmental Charter Schools’ Green Ambassadors Institute (GAI) with over eighty representatives from schools and organizations who are here to share their experiences incorporating real-world issues in the classroom and to inspire action in their communities. I am a teaching credential candidate preparing for student teaching in the fall, and a lead tutor for students in the Lawndale School District. This event is important to me on many levels because not only do I work for ECS, I also get the chance to see firsthand as a teacher-in-training what students are capable of when they are passionate and engaged with what they are learning. Educators are tasked with an unusual request to focus on readying students for working in a 21st century career, however, there is no precedence really on how to accomplish this. For example, my professors and other teacher peers encourage me to teach current and relevant texts that will matter to students, and many of my own lessons rely heavily on group work toward a common goal. But I notice that students still approach and emerge from these lessons with varying degrees of apathy, regardless of how current an issue may be. Comparatively (and quite impressively), at the Green Ambassadors Institute, students are enthusiastic, adept and well-versed in the issues they are studying. In my teacher training, I have become familiar with the Partnership for 21st Century Learning. This organization has created a research-based framework to “define and illustrate the skills and knowledge students need to succeed in work life and citizenship.” I see the “4 Cs” of Creativity, Critical thinking, Communication and Collaboration happening in spades at Green Ambassadors Institute, along with other learning innovation skills that are a main component of the 21st Century for Learning framework (you can learn more about it at www.p21.org). At GAI, students and teachers share how to tackle current, relevant environmental issues and social justice matters in ways that utilize and develop the 4 Cs skills. 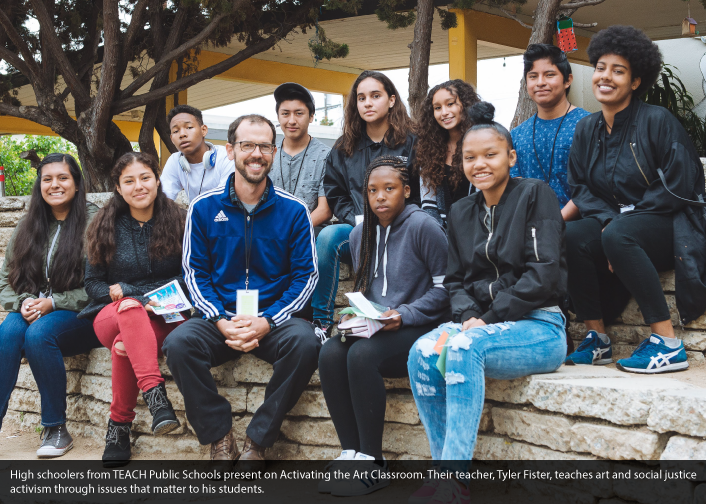 Tyler Fister of TEACH Public Schools in South LA and his group of students present a lesson called, “Art as Action: Activating the Art Classroom.” Students challenge dominant narratives impacting their lives in South LA. Students use art poster techniques and strategies to address health care, immigration laws, the police and racism. Another example of 21st century learning at GAI, teacher Betsy Rivera provides an environment that fosters independence, collaboration with others, problem-solving skills, utilization of modern technology and the ability to act on creative ideas and make an effort to find solutions. Rivera shared about student-led Teach-Ins, educational events in which members of the community learn about issues that directly affect them and are encouraged to share what they’ve learned. Ms. Rivera and her students recounted the Teach-In that students led. The high school students planned every detail of the event, including the presentations and catering. Rivera assigned the initial issues that students were to cover during the Teach-In, her students communicated multimedia presentations in both English and Spanish, and made food to sell during the event. She allowed her students a great deal of creative freedom while they adhered to standards of academic vocabulary and professionalism while collaborating with each other and presenting during the actual event. Her students worked diligently in class to hash out the details of the event and practice their presentations. Student presenters called upon their guests to act upon the information they received. By informing other members of their community about what they learned, they would spark movements of change. Students reported that they learned to work together, improve their public speaking, be organized, and manage the logistics involved in event planning — all skills and valuable knowledge they will take with them into their 21st century careers. I hope to instill the same passion and inspiration in my students that I saw at Green Ambassadors Institute. Student-driven, collaborative learning is an invaluable framework to see in action. I learned specific ways of teaching using the issues and ideas that matter most to my students. Green Ambassadors Institute is run by ECS teachers and students to inform other teachers, students and members of the community of innovative approaches to teaching and practicing environmental practices and social justice. In educating students and teachers about issues that directly influence the community, I found the Green Ambassadors Institute to be an excellent and inspiring example of the 21st century learning movement. Ally Chew is on the ECS storytelling team. She is also currently completing her teaching credential and begins her student teaching this fall at an LAUSD middle school. Contact: Sammy Lyon at sammy_lyon@ecsonline.org for any follow up inquiries about Green Ambassadors Institute.